~ 'Windsong' by Judith Nicholls. 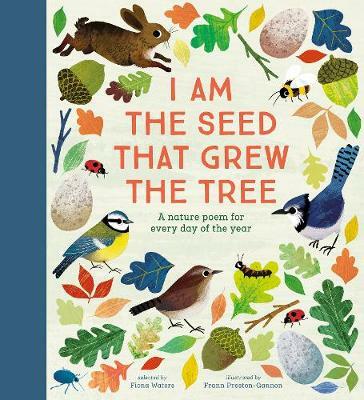 This poem gives its name to a new book of poetry 'I Am the Seed That Grew The Tree' that recently made its way to my bookshelves. Although I am an avid reader I'm buying fewer and fewer books each year so much so that new books have become a mere trickle. This is one though that I couldn't resist after reading a review in a Saturday newspaper. Although I will not settle down to a thorough browse until much later this month my initial impressions are that this volume is an absolute gem. The book contains a nature poem for every day of the year. It has been published by Nosy Crow in conjunction with The National Trust. Within its pages are poems about snowflakes, stars, moonlight, seasons, storms, rain, rainbows, fog, wind, flowers, fruit, vegetables, leaves, trees, sea and seashells to name but a few themes, as well as all manner of wonderful creatures. Every page is illustrated by Frann Preston-Gannon with big bold colourful images which are every bit as beguiling as the poems themselves. There is list at the start of each month with detailing the poem and its author for each day together with a comprehensive indexes of poems and first lines at the back of the book. Some of the poems are well known old favourites but the majority are ones that I've not come across before so the book will be a voyage of discovery. It is a primarily children's book but it would appeal to all generations. I should point out that the book is hardback and weighty. I find it an effort to pick it up so for children I think it would be a sitting at the table reading activity after adult hands have placed it there. Definitely not one to drop on your toes. You find out more about the story of how the book came to be here. I purchased my book from Hive but is also available through other online sources as well as from national and local high street bookshops. As the cooler months unfold I hope to share more of my reading matter and would really love to hear what you are reading. That sounds a lovely book; I haven't been reading as much as I used too, so some recommendations are always useful, thank you. I was wondering what to get my grand-daughter for Christmas...this is now high on the list, so I shall check this out at the bookshop. Thanks for sharing this. It is now bought from Hive and I have even been told that it has been dispatched. I had not heard of Hive, who I have not used before...so thanks for two introductions. Oh I hope that your grand-daughter enjoys it Noelle if you can bear to part with it :) I've used Hive for a while and have always found them excellent so hope that you have a good experience.